Do you have a favourite distro that you’ve spent hours customising? Mayank Sharma shows you how you can spin it into a live distro that you can pass to friends, family, or even on to DistroWatch! Perfect for mumbuntu and dadbuntu too. Over the years there have been many tools that help you create a customised version of Ubuntu, which is one reason why there are so many Ubuntu respins out there. While most have fallen through the cracks, the Ubuntu Customisation Kit (UCK) lives on. You can install UCK on top of Ubuntu or a derivative distro such as Linux Mint. The tool is in the official repositories and you can install it from the package manager. Additionally, you’ll also need the ISO image of the Ubuntu flavour you wish to customise. To simplify the build process, make sure you use the ISO image of the Ubuntu flavour which includes the desktop you want in your customised distro. For example, if you wish to include a localised Gnome desktop in your custom distro, use the Ubuntu Gnome spin instead of the default Ubuntu image. If you’re on a 32-bit machine, you’ll need the i386 image and not the x86-64 one. However, users of 64-bit OSes can also customise a 32-bit image. After you’ve selected a default language for the distro from the languages you’re building in, you’ll need to select the desktop environment for your distro. UCK will download the localised strings for the desktop in your distro based on the option you select on this screen. You’ll then be asked to point to the ISO image of the Ubuntu distro you wish to customise. UCK will then prompt you for a name for your distro before asking if you wish to manually customise the distro. If you choose to do so, UCK will launch a terminal window chrooted into the build environment. In the final stages of the wizard UCK gives you the option to delete all Windows-related files from your distro and generate a hybrid ISO image that you can burn onto a CD or copy to a USB. Once it’s run through these steps, UCK will unpack the ISO and then download the selected language packs. 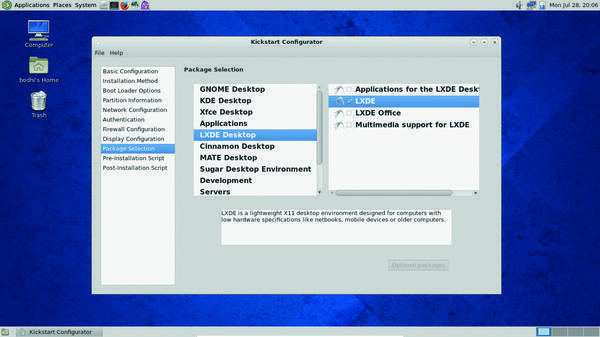 You’ll then get the option to manually customise the distro, if you selected this option earlier. The Run Console Application option will launch a terminal window and drop you to the root shell of the mounted image. UCK lets you customise your distro to the hilt if you know your way around the Ubuntu filesystem. Once you’re done, close the chroot terminal window and select the Continue Building option in the UCK wizard. The tool will now build your new localised Ubuntu distro and point you to the freshly baked customised ISO image. 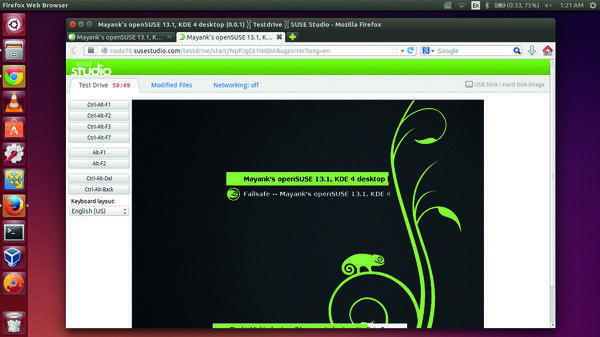 Use SUSE Studio to assemble a distro using the web browser. SUSE Studio is perhaps the easiest tool for creating custom distros. The app is graphical and works inside a web browser. It needs only a web browser and an internet connection, and while it creates OpenSUSE-based images you can operate SUSE Studio from any distro. With SUSE Studio you can create full-fledged desktop distros, minimal dedicated servers, and targeted virtual appliances. You can use the web interface to add users, customise the list of apps and even add files and customise the artwork. Point your web browser to the SUSE Studio website at www.susestudio.com and create an account. Alternatively, you can sign into the service using any OpenID provider, such as Google, Yahoo, Twitter, Facebook, etc. Once you’ve signed in, click on Create New Appliance on the Dashboard. SUSE Studio refers to the custom distros as an appliance irrespective of whether it’s designed for physical hardware or a virtual machine. Before you can begin building your distro, you need to select a base template from one of the predefined ones. The templates help infuse the custom distro with essential packages for your distro. There are templates for the latest and the previous OpenSUSE release, OpenSUSE 13.1, OpenSUSE 12.3, as well as for the SUSE Linux Enterprise distro. Unless you have a licence for SLES, you’ll want to base your distro on one of the OpenSUSE templates. The Just enough OS (JeOS) template is ideal for building a minimalistic system. Then there’s the Server template, which helps you build text-only server distros. Finally there are templates that help customise a Gnome 3 or KDE 4-based desktop distro. Once you’ve selected a base template, scroll down the page and select the processor architecture for the distro. Click on the Create Appliance button to build the base image, on which you can build your customised Linux distro. You can test your images in SUSE Studio’s web-based TestDrive before downloading them. You’re now at the at the main screen of your appliance, which has a set of tabs to help you customise different aspects of your distro. The first tab, labelled Software, is where you choose software packages. Under this tab, you’ve got a list of the enabled repositories and the list of software that’s already installed in your distro. Both of these are based on the template you selected earlier. To install additional software, use the Find box on the page to look for packages in the repositories. When you find what you’re looking for, just hit the corresponding +add button to include it in your distro. SUSE studio will automatically check for and add any dependencies. If the package you’ve just added conflicts with an existing one, you’ll get options to resolve the issue by removing one of the two conflicting packages. If you have some custom apps you can also add their RPMs from this page. In case the software you wish to add isn’t in the default repositories, you can also add additional repos with the Add Repositories option. This brings up a page that’s similar to the one for adding software. Once the repositories have been added, SUSE Studio will list them under the Software tab and allow you to search for packages inside them as well. The bulk of the configuration is handled from under the Configuration tab. This tab is further divided into seven different sections for configuring different aspects if your distro. From the General section you can localise the distro and select the default language and keyboard layout along with the time zone. You can also select how you want your distro to configure the network (DHCP is usually a safe bet) and enable the firewall and open ports for remote access. This is also where you add any users and groups. The Personalise section is where you choose the custom artwork for your distro. You can either select one of the listed ones or upload your own. You can avoid visiting the Server tab, which only has options to add data to either a PostgreSQL or a MySQL server. Similarly, if you’re setting up your distro for a virtual machine, head to the Appliance tab to configure related settings. However, most desktop users should just head to the Desktop tab, from where you can automatically log in any added user and define any apps that you want to autostart. If you consider yourself an advanced user, you can take a look at the Scripts sections, from where you can run custom scripts. This section lets you define scripts that run at the end of the build as well as those that run every time you boot the custom distro. Once you’re done with the sections under the Configuration tab, move on to the Files section to add either single files or an archive of files to the custom distro. All files are added to the / directory. However, once they have been uploaded you can select the files and move them into other locations. For example, if you wish to include a file on the Desktop it should be placed under /etc/skel/Desktop. Now that you’ve customised your distro it’s time to ask SUSE Studio to convert it into a usable distro. Head to the Build tab, which lists options to transform the distro into various formats. You can, for example, create a Live ISO image of your distro meant for optical drives as well as live images for USB and images for virtually every virtualisation software available, including KVM, VirtualBox, VMware, Xen and more. In order to create a traditional installation image, select the Preload ISO (.iso) option. When you’ve select the format, hit the Build button to create your distro, which will only take a few minutes. If you’ve selected additional formats as well, click on the Build Additional button to get images in the other formats. SUSE Studio also assigns a version number to your distro. Every time you modify the distro, it will increment the version number and automatically generate a changelog that’ll list all the changes since the last version. After the image has been built, you can test it from within your browser with the Testdrive option. Once you’re satisfied, use the Download option to grab the image of your custom distro. You can also share your distro with other SUSE Studio users by heading to the Share tab, where you get textboxes to describe your distro. Once you have the image you can use it as you would any other distro image. SUSE Studio has a very low threshold of entry and can be used by virtually anyone regardless of their level of Linux expertise. Most of the time-consuming and heavy-duty tasks, like fetching packages and assembling the distro, happen at the remote SUSE servers. You can also test the images remotely and only grab them once you’re satisfied with your creation. The system also preserves your build system, and you can tweak it and make changes without much fuss. It’s a great place to start. 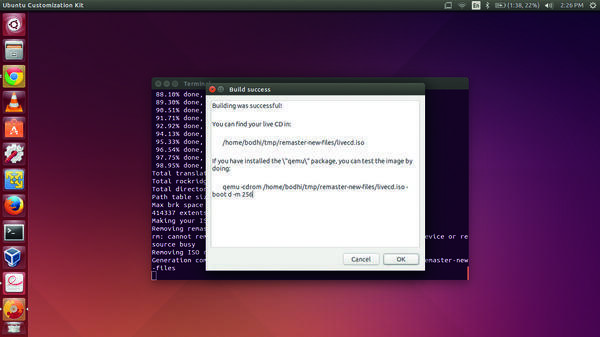 If you want to roll out Ubuntu on a bunch of identical machines with similar configurations and the same software, like in a lab or office, you can save yourself some time by creating automated installer images. The www.instalinux.com service is an online service like SUSE Studio, but instead of full-fledged OpenSUSE-based distros, it churns out small ISOs that are designed to prepare ready-to-use Linux machines by automatically fetching packages and installing them. The web service is powered by the SystemDesigner CGI scripts from the Linux Common Operating Environment project (http://linuxcoe.sourceforge.net). The interface takes you through the steps involved in installing a distro, such as selecting a keyboard layout, timezone, password for the root user, package selection and the disk partitioning scheme. Once you’ve answered the questions, it creates a preseed installer and puts it on a small (about 30MB) CD. SUSE Studio isn’t the only web-based service for creating Linux distros. 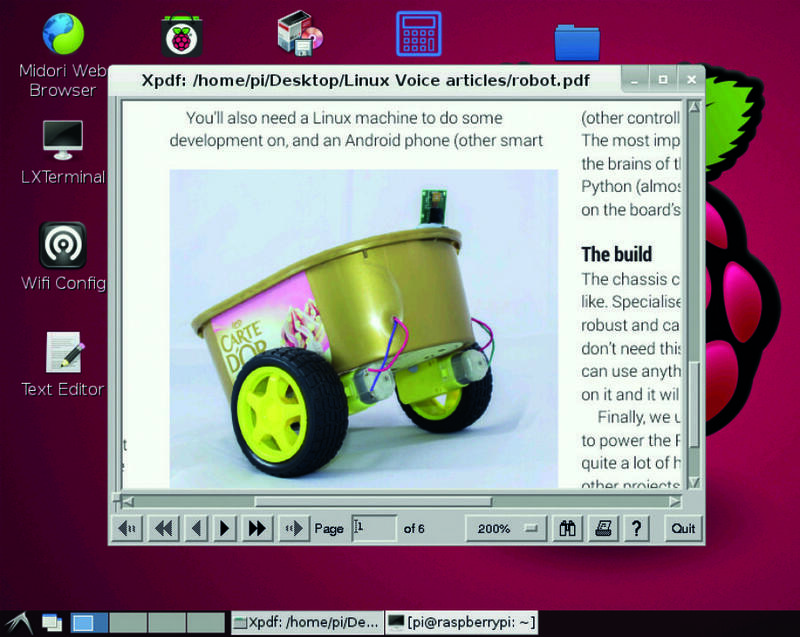 The Debian Builder (http://live-build-cgi.debian.net/cgi-bin/live-build) is hosted by the Live Systems project, which produces the tools that are used for producing official Debian live images. The service can create basic netboot images without the X server as well as hybrid ISO images that boot from USB disks. You can create a basic distro by selecting a handful of options including the Debian branch you want the image to be based on (Wheezy, Jessie, Sid) and the predefined group of packages (Gnome Desktop, KDE Desktop, Mate Desktop, Rescue, etc). Advanced users can also tweak additional advanced options. You get options to choose the architecture of the build, the filesystem of the chroot environment, the bootloader, whether it should include the Debian installer, and a lot more. The service will email you once your customised Debian Live system is ready to be downloaded. Then there’s the Porteus Wizard (http://build.porteus.org). Porteus is a small portable distro that’s based on Slackware. Using its straightforward but feature-rich web interface you can build a customised version of Porteus with your choice of desktop environment (KDE4, Mate, LXDE, Xfce) and a host of popular software including web browsers (Firefox, Chrome, Opera), word processors (LibreOffice, AbiWord), VoIP client (Skype), graphics drivers for Nvidia and AMD Radeon, and more. You can also customise advanced boot parameters such as setting a custom size for a tmpfs partition and enabling the zram kernel module. Create distros based on Fedora Linux. If you live in RPM-land and are more adept with Fedora, you can put together a customised distro using its livecd-creator tool. This is a set of scripts that are available in the official Fedora repositories. Unlike UCK, livecd-creator works solely on the command line, and instead of an ISO image of a Fedora release, you can grab all the packages you need in your custom Fedora distro from the internet. The scripts use the powerful Kickstart files to set up your customised Fedora-based distro. If you haven’t heard of them before, a Kickstart file is a simple text file containing a list of actions such as package names. The livecd-creator tool compiles your distro as per the instructions in this file. To help you get started, you can download the Kickstart files for several Fedora spins by grabbing the spin-kickstarts package from the repositories. Once this is installed, you’ll have a bunch of Kickstart files under the /usr/share/spin-kickstarts directory. You can customise any of these Kickstart files by editing them in any text editor. Although they are fairly straightforward and well documented, you can browse the Fedora wiki (http://fedoraproject.org/wiki/Anaconda/Kickstart) to get a hang of the various options. This tool has an easy-to-navigate graphical interface for creating a Kickstart file. New users will be well advised to use the graphical Kickstart Configuration tool (found in the system tools) for selecting software for their custom Fedora-based distro. The –fslabel switch specifies the name for your custom distro. When the tool has run through all the instructions in the Kickstart file, it’ll assemble the ISO image for your distro and place it in your home directory ready for you to dd it to a USB stick. Create your own Raspberry Pi distro. We made a custom version of Raspbian for LV006’s cover DVD – with NOOBS, you can too. The New Out Of the Box Software, or NOOBS is the Raspberry Pi’s official installer. It has simplified and standardised the procedure for installing a distro on the Raspberry Pi. While the main purpose of NOOBS is to simplify the installation of an operating system on to the Pi, the tool can also be used to create a custom distro. To get started, grab the NOOBS installer from the website and install any of the supported distributions that you want to customise. We’d advise you to use the Raspbian distribution, which is also recommended by the NOOBS installer. You can also install and remove apps either directly via apt-get or by first installing the graphical Synaptic package manager. command to expand the root partition to fill the SD card. Also make sure you set up the distro to work with your network hardware straight out of the box. So for example, you can configure the wireless adapter to connect to your Wi-Fi access point and access network services such as the directory server, or change the default browser page to point to your intranet landing page. This command can take up to half an hour to complete depending on the number of changes you’ve made to Raspbian. command. This will not take much time, and when it’s done you’ll have a file called boot.tar in the boot directory. NOOBS requires compressed versions of these files. But the Raspberry Pi doesn’t have the resources to squeeze these files. So you’ll have to move them out to a regular desktop PC where you can compress them with the xz -9 -e boot.tar and xz -9 -e root.tar commands. This will replace the files with their compressed versions, namely boot.tar.xz and root.tar.xz. Now format the SD card and extract a fresh copy of NOOBS into it. Use the file manager to navigate to the os directory under the newly extracted files. This directory further contains a number of directories, each of which containing the files for a supported distro including Arch, Pidora, Raspbian and others. Since our custom distro is based on Raspbian, we can remove all the other directories from under the os folder. Rename the Raspbian folder to the name for your custom distribution. Head inside this folder and open the file named os.json in a text editor. In the file, replace the text beside the name and description fields from that of the original Raspbian distribution to your custom one. Also, make sure you remove the file named flavours.json. You can also optionally change the artwork of the distribution. Finally, remove the existing root.tar.xz and boot.tar.xz files from under this folder and replace them with the ones you’ve just created. That’s it! Now boot the Pi with this card. The NOOBS menu will now list your unique, customised Linux distro. 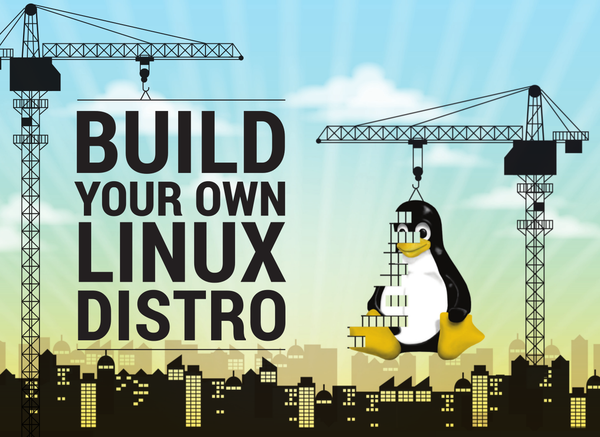 Build your Arch-based custom distro from the ground up. If you have the patience to hand craft a custom distro from scratch, you should build one on top of Arch Linux. The distro’s approach to allow the user to craft their installation from the ground up makes it an ideal platform for cultivating a custom distro without the code bloat and package proliferation that afflicts so many other popular distros. You can create a custom Arch-based distro with the command-line Archiso utility. The utility is a collection of Bash scripts, and although it has a steep learning curve it gives you a lot of control over the final result. The first thing you need before you can use Archiso is an Arch Linux installation. If you don’t already use Arch, follow Graham’s tutorial in LV001 and also available on the LV website (www.linuxvoice.com/arch-linux) to setup a working Arch Linux system. Once you’ve installed Arch on your computer, the next step is to customise it to your liking. That includes installing more packages, swapping out the default themes and artwork of your desktop environment and configuring other aspects of the systems such as the network. Later on, we’ll copy these customisations and configurations from the installed instance of Arch over to the custom distro we’re building. Make sure you have enough free disc space to accommodate all the apps you wish to install, along with any files you want to copy over to the custom distro. Arch Linux is already pretty snappy, but once you’ve mastered Archiso you can use the tool to create streamlined distros that can outperform all others. Telling Archiso which packages to put on the custom ISO is as simple as adding them to a text file, one package name per line. Under the ~/archlive directory you’ll have three files: packages.i686, packages.x86_64, and packages.both. You can open these files in a text editor and include the names of the packages you want in your distro. Archiso will read the files for the respective architecture and include them packaged in the final ISO, which will be a dual-boot ISO that’ll work on both 32-bit and 64-bit machines. However, for consistency we recommend you add the app names to the packages.both file so that they are available on both the architectures. /etc/systemd/system/display-manager.service file from the host machine to its corresponding location under ~/archlive/airootfs/, along with directories that house custom artwork, namely /usr/share/backgrounds, /usr/share/icons, and /usr/share/themes. Similarly you can copy over any files and directories from under your home directory to the skel directory, including ~/.xinitrc and ~/.config. Replace bodhi with the name of your user. Inside root’s home folder (~/archlive/airootfs/root) there’s a file named customize-root-image.sh. Any administrative task that you would normally do after an Arch install can be scripted into this file. Remember that the instructions within the file have to be written from the perspective of the new environment, which is to say that / in the script represents the root of the distro that’s being assembled. In both these commands, replace bodhi with the name of your user. to initiate the build process. The -v switch enables the verbose mode, the -N switch sets the name of the ISO image, -V sets the version number and -L appends a label to the generated ISO image. You can now copy the ISO out of the build system and share it with anyone. After a while though, you’ll want to update the system. Maybe the included apps have had a newer release since you last created the ISO image, or maybe you need to change any of the other files that you’ve manually copied into the distro. to generate the updated iteration of your custom distro. Linux is a popular choice in the embedded space. However the field is saturated with different embedded Linux distributions. To curb this proliferation, the Linux Foundation along with industry leaders such as Intel, AMD, Freescale, Texas Instruments, Wind River and others have created the Yocto Project. The main aim of the project is to create and make available the build environment and tools for creating an embedded Linux distro. The project supports various 32- and 64-bit embedded architectures such as ARM, PPC, and MIPS. Using these tools developers can build a complete Linux system for an embedded device. To aid developers the project offers the Hob tool, which is a graphical front-end for the project’s build engine called BitBake. Hob reads recipes and follows them by fetching packages, building them, and incorporating the results into bootable images. You can install it on all the popular Linux distros including Fedora 20, Ubuntu 14.04, Debian 7.4, OpenSUSE 13.1 and CentOS 6.5. From Linux Voice issue 8. Click here to subscribe for more top-quality Linux learning every month!